​Join our group on Facebook! New auction starting soon for November! Sparkle Cat Rescue is proud to partner with The Cranford Group from Burlington, North Carolina, and produce The Colorful Garden flags, with a portion of the proceeds donated to help our rescues! Send in your favorite photo of your pet or yourself or another person and their pet, and get a custom-made garden flag! 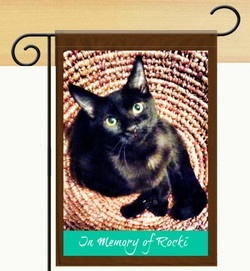 These flags would also make wonderful 'in loving memory' pet tribute flags for your beloved cat, dog or other pet. Beautiful in a special pathway, garden, or outdoor spaces. These flags are great gift ideas for special occasions and holidays. The quality of the flag is determined by the quality of the photo. Vertical art is best. Double-sided for display flexibility. "The Colorful Garden is a leading provider of house and garden flags, door mats, and other accessories. Our products are vibrant personal "notes" to accent your garden, yard and home. They are also suitable for framing or hanging." You may have seen their flags at local businesses such as Nature's Emporium, Personally Yours, and Farm Services in Burlington, NC. The Colorful Garden products are designed and printed in North Carolina. You may pay via check or credit card (The Cranford Group will contact you after they receive your order form). Flags will be mailed within 7-10 business days of receipt of order. Shipping and tax are included in price. If you would like to pick up your order rather than have it shipped, please inform The Cranford Group when they call for your payment preference. This fundraiser has no end-date! Money raised will help our kitties with their medical care (spay/neuter, vaccinations, flea preventative, combo testing) as well as food and supplies needed while they are in foster care. Contact us to make arrangements to pick up a 2019 Attractions Dining & Value Guide! 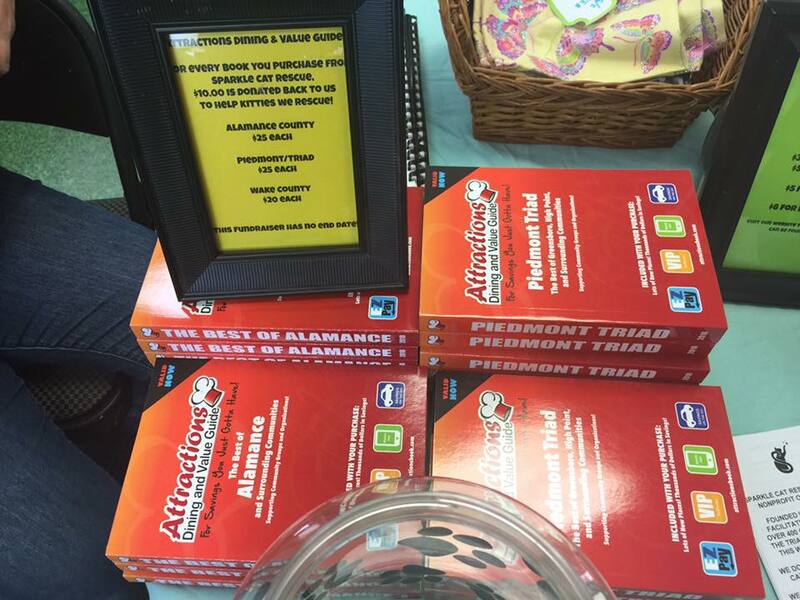 We can get Alamance County, Guilford County, and Wake County books! ​Help us raise money for our kitties!